CD review: "Brothers in Arms"
With the release of their debut album and its breakthrough single, "Sultans of Swing," in 1978, Dire Straits immediately installed themselves in the pop consciousness. However, their next two albums were rather stagnant artistically. Their fourth album, "Love Over Gold," was a big step forward musically, as Mark Knopfler and Co. (only bassist John Illsley and Knopfler remain from the original lineup) experimented with different rhythm patterns and more complex structures. Their latest release, "Brothers in Arms," continues the growth of "Love Over Gold." If not quite as melodic as their earlier ventures, the variety of material and Knopfler's continued growth as a composer more than make up for any lack of cute tunes. None of the other songs seems as likely to get the kind of airplay "Money for Nothing" is getting, but "So Far Away" and "Walk of Life" are two of the better tunes Knopfler has written. Both are built around catchy little guitar riffs in Knopfler's distinctively twangy style. 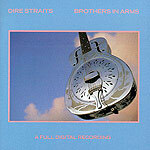 "Brothers in Arms" is a welcome effort, and hopeful portends yet more musical growth from Dire Straits.